It’s fun to look back at the past 52 weeks when this time of year rolls around. There are several 2014 movies that have made their way onto the IMDb top 250, but these are the top 3. And please, NO SPOILERS in your comments! I’ve only seen one of these movies, though likely before this Friday I will have seen another. Hopefully all three. A basic need that we all have it to be heard. When Joy and I had a miscarriage back in 2003 we went through a time of conflicting and overwhelming emotions. I can remember that telling someone my story was the one thing that I felt I needed terribly. This post is not about that story. I’ve told it already on this blog. But it is about all of us and our collective stories. I was surprised to see that Toy Story 2 received more votes than the other two in this franchise seeing as both the first and third are on IMDb’s top 250 but not this one, and the same is true of Empire’s list of 301 Greatest Movies of All Time. But I’m glad it is our Movie of the Week. There is a moment in this movie that can almost be described as having a transforming moment for computer animated movies. There are sad moments in cartoon movies, but few can compare to the ones that Pixar puts before us. Before Carl and Ellie’s moving opener to Up, before Frozen’s wall is raised between two sisters who love each other dearly crushing their spirits and ours, and before Finding Nemo’s heart-string-tugging moment where Nemo listens with childlike wonder to a pelican’s tale about his dad’s undying devotion to find him, we had an unexpected interlude telling us Jessie’s story. And this moment was definitely different than most. At this moment we weren’t given a sympathetic story of an already sympathetic character like Woody, Buzz, or even someone like Slink whom we’ve already grown to appreciate and love. She is brand new and a little too aggressive for Woody’s and our liking. She’s convinced that the best thing in the world for her is for Woody to abandon Andy and move to Japan in a foam-lined travel case provided by a slimy toy salesman. And she’s not the quiet, attractive beauty who gracefully floats in and wins the heart of a main character. She is a yodelling cowgirl for Pete’s sake! (No pun intended Stinky Pete.) But when Sarah McLaughlin starts to sing, “When She Loved Me,” and we find out what happened to Jessie, we immediately empathize. We’ve been there. It’s good for us to hear this. Like me you may have been torn about the plight of the toys in this movie. Maybe it would be better to go to the museum across the ocean. Being adored forever by children and adults alike? No being stored in darkness nor facing destruction by way of burning or decay in a garbage dump? I’ll take it! But we can relate to the desire for relationship over fame, fortune or mere existence. When I shared my story about losing a child before getting to meet him/her, I was guarded just like Jessie. I couldn’t just blurt it out. I also didn’t want to share with someone who would simply explain my hurt away, nor someone who would bawl and say how sad it was. I just wanted to be heard. And like Jessie, I experienced healing after doing so. I’ve also listened to others’ tales and had to make myself not try and prescribe anything or impose anything on them. That too is a healing exercise for me. Listening is a self-sacrificing work that gets better with age, practice and love. Congratulations Toy Story 2. This is your week. Best Actor: Michael Keaton as Ken. He was hilarious, and it’s nice to see an older actor who some accuse of being washed up sweep in and nail his role and win everyone over. Best Quote: “You’re right, Prospector. 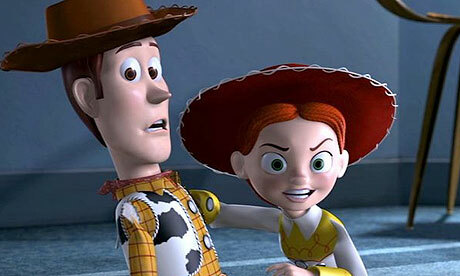 I can’t stop Andy from growing up… but I wouldn’t miss it for the world.” — Woody in Toy Story 2. Sometimes I feel a little guilty about the toys I’ve left behind in my life. Then I shake my head. It’s a movie you idiot! But I want to make the most of the relationships I have now while I still have them. I’m going to grow old and so will my wife. My kids will grow up. My dog will die. So will many people I love. But I’m not going to miss these things for the world. They’re my story. They’re all I’ve got. Very few people don’t like the Toy Story series, and most can tell you the one they like the best. I for one have a hard time picking one. Even the second one stands up against the other two extremely well. Each installment has a very original and engaging story (even thought provoking) and awesome new characters. So which one do you think is best? Which one will be movie of the week? 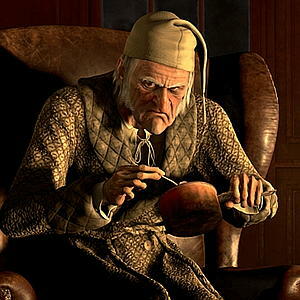 Today when we use the word ‘humbug’ or ‘scrooge’ we mean someone who is stingy. Turns out they had original meanings that can help bring the story even more alive to us. Of course the story is already very much alive to us today. It is the most commonly known, told, and acted Christmas story next to the Nativity (And if anyone starts to boycott it because it’s taking Christ out and therefore destroying Christmas, SO HELP ME…) and most of us can recite lines from the book regardless of whether or not we’ve read it. It’s that much a part of our culture. It means a lot to us, and for good reason. More on that later. For now, the meanings. Scrooge. This word was used as his name but not because it meant greedy. It was a slang term in Dickens’ day and it simply meant “to squeeze.” This is an interesting word picture as Ebeneezer would a) squeeze every last nickel (or farthing, or crown… Oh the Brits and their kooky talk.) from those around him. He squeezed every work minute he could get out of Cratchit and paid him the least amount he could get away with. And he would b) squeeze every last nickel (or tuppence or ha’penny… Brits are weird.) out of his own hands. It’s true. This is a man who made sure no one robbed him of even the smallest coin, yet he’d rob himself of any reasonable comforts. To say he lived frugally was an understatement. He liked his flat to be dark because darkness was cheap. Gee, maybe he was actually Scottish? Humbug. This is the one that really came alive to me. When we see Alastair Sim on the screen scowling and uttering ‘humbug!’ we tend to convert it into our language as the equivalent of say, an old man scowling in 2014 and saying “Hogwash!” or “Baloney!” or “BS!” But that’s not what Ebenezer was grumbling to his nephew and Cratchit. The word referred to the act of putting forth an effort to deceive people by pretending to be lofty and/or sincere. Perhaps a salesperson acted like he cared for your health enough to provide you with a product at a reduced rate, but you believed it was merely a clever ploy to convince you to buy the product from him directly. Or maybe when you were in middle school people were really nice to you when you had two chocolate bars in your lunch. Or if you did well on tests you magically made friends around exam time. We tend to hate this, don’t we? None of us like to admit that a commercial had any effect on us. We would rather be the one to say that we stuck it to the man by getting a great deal and talking the salesperson down to a lower price. So maybe we can relate with Scrooge a bit more than we’d thought. To him, anyone trying to cheat him out of his beloved cash and pretend it was all a part of peace and good will toward men needed to be ashamed of themselves. He would not fall for their foolishness and he had no time for them. His ideology was blinding him. Just tonight I watched Downfall for the second time. It’s the story of the final days of Hitler and his inner circle as WWII drew to its climactic end. One character pleads with the Fuhrer to lead them to the Final Victory (an important part of Hitler’s home-made gospel) when defeat was more certain than life itself. Many loyal SS troops held the same kind of loyalty to Hitler even after he had committed suicide. It is my hope that any ideology I have in my heart and mind never blinds me as it did Scrooge, Hitler, the SS, followers of Jim Jones, or anyone else in history who forsook the benefit of human life and love of fellow human beings for what someone else says is more important. Congratulations Scrooge (aka A Christmas Carol). This is your Week. Best Actress: Carol Kane as the Ghost of Christmas Past in Scrooged. She is hilarious in this movie, just as she was in Princess Bride. Which reminds me, a close runner up should be Robin Wright who played Bell in Jim Carrey’s A Christmas Carol, who was also in Princess Bride. She was Buttercup. I love all four of these movies, though to pick I would side with the Muppets. First of all, it was the first movie date I ever took Joy on. We kissed through most of it, though Joy was shocked how much of the movie I remembered despite this. Second, it’s pretty much a family tradition for us and the kids to watch this movie each year. We still only have it on VHS, so we have to get the DVD soon. I saw that a local store was selling it for $20 but lowered the cost to just $2 as a way of showing appreciation to its customers. I say humbug. They won’t fool me! People often talk about their favourite version of the Christmas Carol they like best. In my experience I hear the following ones mentioned most. A big one that is not on this list is Mickey’s Christmas Carol (1983) but I decided to leave it out as it is technically a short, not a full-length movie. It would begin with a log cabin almost buried in snow in a small fir tree glen on a Maritime countryside with a chimney lightly puffing out smoke like my Grampy Melanson used to do. It would look like the sun had only been up a few hours; that bright, crisp new look that a winter morning can have. The kind we only notice on Christmas Day and select winter Saturdays. The camera would keep moving up on that log cabin until we saw inside. And there standing by the fireplace stoking the glowing yule log is a man with his back turned to us. He is wearing jeans and a comfortable plaid flannel shirt, but you can see that his arms and legs are well muscled. He is slightly tanned and carries an aura of being warm and gracious, yet one not to be trifled with. He turns to the camera and to the audience’s delight, that man is me. And I’m about to make a super cool announcement. Of course, I act like I just noticed they’d arrived and I tell them that we’re about go on a special holiday journey together. I tell them to meet me at the front door where I’ll let them in, just as the Friendly Giant would before the recorder music. And yes, as they come inside they discover that there is a window with a giraffe head poking and it welcomes them with a lazy voice. Beside that window is a cloth bag hanging on the wall with a rooster in it. Of course this will only be for an instant as not everyone in the TV viewing audience would happen to be middle-aged Canadians. Then I would tell them that if they close their eyes and make a special Christmas wish we would find ourselves on the anticipated journey. The good folks watching from their couches at home will surely all oblige, and when their eyes are opened they discover that we are all in a big sleigh with Santa. We’re flying through the air at Millennium Falcon speed with wind and snow whipping through our hair. It is stupendous! And it’s not just stupendous because of Santa being there. Usually you can’t get any more stupendous than that, but in that sleigh with us is Adam Sandler singing the Hanukah song. No one will care that he’s not that funny anymore, they’ll still laugh. And he will have with him Frosty the Snowman who is still smoking that scandalous pipe. Then Santa, always the character to have something up his sleeve, had some more jingle jangle stupendousness planned for us. Unexpectedly we start flying higher, and straight upward. We fly so far we pass the moon, we wave at the Pigs in Space spaceship, we narrowly miss the Death Star’s tractor beam and we land squarely on a planet completely inhabited by stop animation characters. We sing Christmas carols together on that planet, which I imagine would look like it was constructed entirely of materials purchased at Michael’s. There would also be a snowball fight. I’d win. No, I’d tie with Santa and we’d do a side bro-hug while everyone applauds. Finally, we would all say our goodbyes to the brown felt reindeer, the styrofoam snowmen, the yarn-bearded men, and the insanely-small-mouth children and climb back into the sleigh. Santa would drop the audience and I off in a place that was completely dark. Maybe even a little scary. In the darkness a child’s voice would be heard. “Why would Santy Claus do this to us?” that voice would wimper. Then, after a big number of Grover, The Count and I singing “I Saw Three Ships,” I kneel down in Christmas thanks. The camera pans in closely so that the screen is filled only with my earnest face complete with victorious yet astute smile and squinting eyes. It pans back out and I am sitting by the fire. Stockings are hung, a tree with presents sits to my left. Roddy Piper sits in another chair on the other side of the hearth as we share an eggnog together. I tell everyone to have a safe and happy Christmas, then look at Piper and we laugh. At what, I don’t know, but that doesn’t matter. It’s the perfect way to end the special. I hope you enjoyed this special as much as I did. Don’t tell me you didn’t get goose bumps several times either. Congratulations Christmas Eve on Sesame Street. This is your week. Best Actress: Sonia Manzano who was Maria on Sesame Street. I had such a crush on her when I was six. 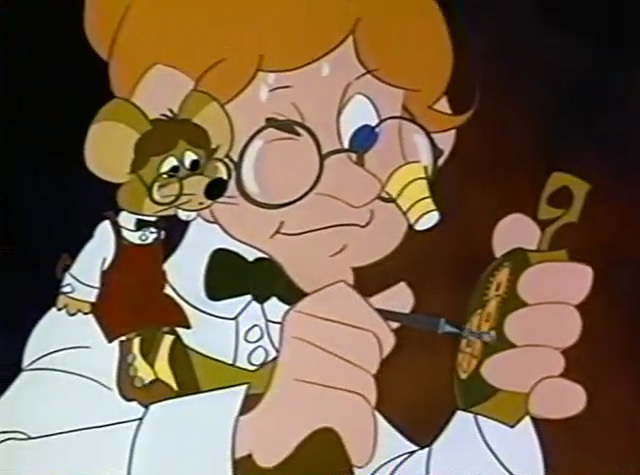 Best Actor: Tammy Grimes who voices Albert on Twas the Night Before Christmas. I remember feeling a little emotional watching this as a kid. The character and the voice are perfect for the story that’s told.